Common wisdom states that the best way to understand a concept is to explain it to someone else. As the Roman philosopher Seneca said, “While we teach, we learn.” Students from Eugene Lang College of Liberal Arts will put this philosophy to work as they share their academic, creative, and research projects at the Dean’s Honor Symposium. Projects ranging from academic writings and creative works, to civic engagement and social justice research will be presented during a poster session and panel presentations. Exemplary work developed outside of Lang, including projects created as part of an internship or work experience, will also be presented. The Dean’s Honor Symposium provides students with a great opportunity to develop subject mastery through learning how to present the results of their rigorous research projects. Whether they pursue careers in theater, technology, or academia, the skills they learn in having to present intricate materials in an easily digestible manner will serve them throughout their lives. While the Symposium is a celebration of students’ hard work, there will be fun and games. This year, a Student Success Social will be held in conjunction with the Symposium, providing a fun atmosphere – food, music, scavenger hunt and prizes – in which to meet students from other majors and departments. 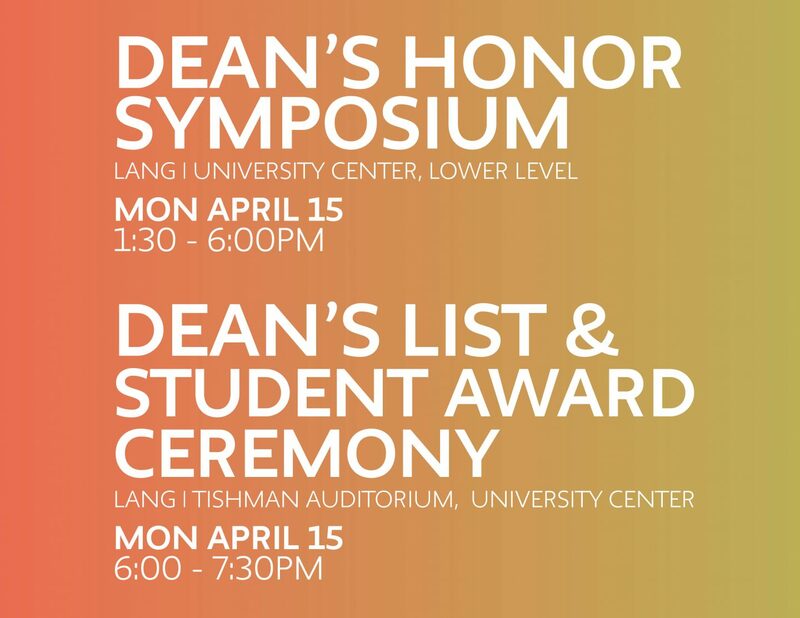 The Symposium will be followed by the Dean’s List and Student Award Ceremony, a celebration of Civic Engagement and Social Justice Mini-Grant recipients, Eugene Lang Opportunity Awardees and Lang Global Ambassadors, Dean’s List, and other high achieving students.